Sergei Loiko was born in Moscow in 1953. He served in the Soviet army and was later awarded a degree in philo- logy. 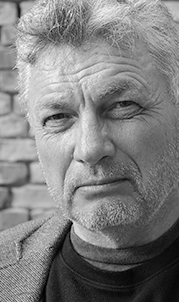 In 1989, Loiko became a translator and reporter for the Associated Press and later a producer for the British television company TV/am; he has also contributed to Novaya Gazeta and Echo of Moscow radio. Loiko has cover- ed armed conflicts, revolutions, and wars in Romania, Tajikistan, Chechnya, Georgia, Afghanistan, and Iraq. For the past twenty-five years, Loiko had been the Moscow correspondent and photographer for the Los Angeles Times, specializing in wars and armed conflicts. Loiko covered the Ukrainian revolution and the subsequent war virtually nonstop from the first day until 2015. In 2014, for this reporting, Loiko was awarded one of the highest prizes in American journalism, the Overseas Press Club’s Bob Considine Award, “for its guts, credibility, originality, depth and sophistication of interpretation, and its engaging writing style”. He has also been awarded the prestigious Los Angeles Times editorial award for “Best Reporting in 2014”. The rights of his Documentary novel AIRPORT have been sold to 9 countries. Sergei Loiko now lives in Texas, USA, and Moscow, Russia.